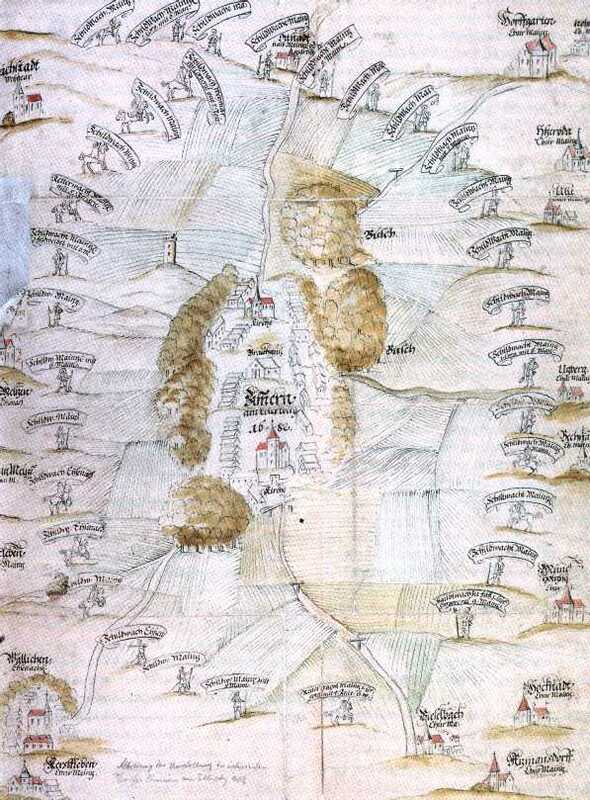 When Nuremburg suffered the plague in August 1562, the city councilor moved to Noerdlingen with his family where they stayed for half a year until the plague had died out. In memory of the time they spent there, they left behind a painted sign made of wood with the coat of arms of the 31 Patricial families in the tavern of the city hall of Noerdlingen. Already in the 13th century B.C. it was recognized that specially qualified personnel was needed to prevent and fight transferable diseases. In the Old Testament book of Leviticus, chapter 13, each person was obliged to report any sign of a rash to the priest in order to rule out the disease of leprosy. In case leprosy could not be immediately ruled out, the priest had the authority to isolate the person for seven days, followed by an additional period of seven days if deemed necessary. If leprosy was found to be the disease, the person became excluded from the community. In 1486, the health magistrate of Venice was given the authority and responsibility to supervise the distribution channels of food, the supply of drinking water, waste disposal, medical personnel, hospitals, the lodging of guests, the supervision of beggars, harlots and procurers as well as the Jews. 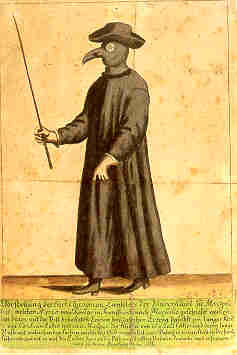 The protection clothing of a plague physician in Marseille in 1720: long leather dress, globes, mask with beak which was filled with aromas (from herbs), “eyes of crystal”. All persons who came into contact with victims of the plague had to carry the “plague stick” in order to be recognized. 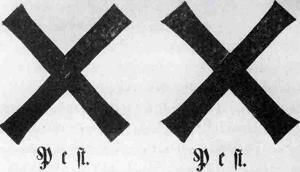 Affected houses and corpses were marked with the corresponding symbols. Based on the perception that the plague would disappear after 40 days (Italian: quarantena), suspected persons would be isolated during this period, as was conducted in 1377 in the town of Ragusa (now: Dubrovnik). In Venice, people suspected of being infected or ill were sent to reside on the separate island where the Nazareth monastery was built. 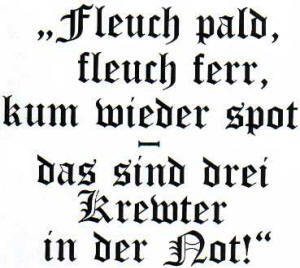 This led to the creation of the word “Lazarett” (German for military hospital). If there were no such institutions for isolation available, the infected people were split in order to live separately from the healthy people. They were looked after by their neighbors or by specific personnel. Although the sources of the plagues were unknown, burned incense and washing with vinegar water were seen as the most effective ways to eliminate the diseases. The toxic air (miasma) was sought to be dispersed by burning herbs and mixed spices. 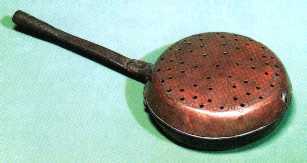 Therefore, so-called incense burners were used, which resemble our modern-day atomization pots. Even letters were pierced and placed in a three-piece incense box. In order to check if fabrics and goods were infectious, cleaning servants had to rummage around in them with their bare arms and wait if they became sick. 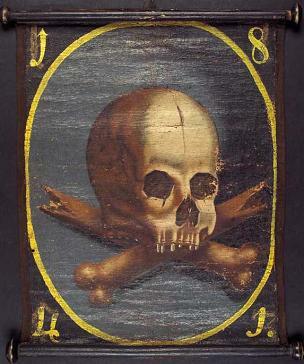 When, in 1630, the public health officer of Florence also prohibited church events to take place, the bishop accused him of heresy. Eventually the whole health magistrate became excommunicated by the Pope. When a ban on hosting a church service was decreed in a village in England, the public health officer found the entire population at the church of the neighboring village. 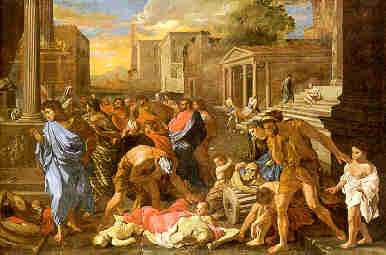 The ban was imposed in the cities in which the plague appeared. In detail this meant that the transportation of people and goods were stopped. Due to economic interests, certain public-health officials wrote false medical certificates, which led to the epidemic espionage of the trade partners. By building a 1.900 km long “plague cordon”, Austria unsuccessfully tried to prevent the plague from spreading from the Ottoman Empire. Another failed attempt took place when Prussia tried to block the cholera coming from Poland, since the epidemic was brought in by sea to the towns of Koenigsberg and Danzig. In Danzig, the house barricades ruined the city because even the healthy people were not allowed to go to work, but instead they had to be given supplies. Plagues were always considered to be a punishment by God. Therefore, the local population often disregarded the ban of church activities. In 1527, Martin Luther wrote the piece “Ob man vor dem Sterben fliehen möge” (“If one wants to escape death”) in which he recommended going to church and listening to sermons regularly as well as confessing sins and receiving the sacraments every eight or fourteen days. Lastly, he recommended keeping a will stored away as a precaution. In 1632, Kasper Schisler, a day laborer from Eschenlohe, evaded the sentries in order to attend the parish fair which led to the Black Plague being brought to Oberammergau. Only after a vow was given to conduct a passion play, which is held every ten years up to this day, did the plague die out. “Theriac”, a mixture of opiates, snake poison, dried toad powder and other items, was used as an antidote. In addition, the bloodletting further weakened the poor patients of the 14th century. 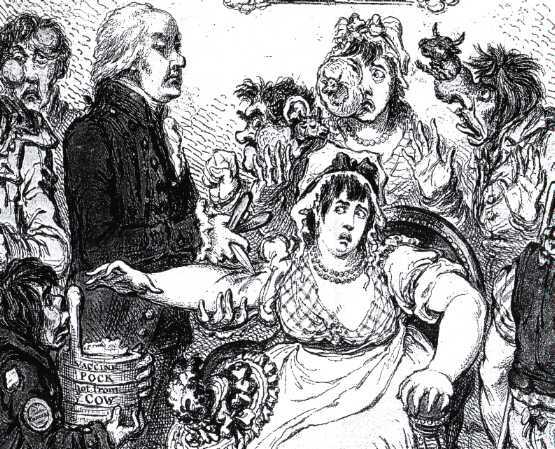 Caricature of the opponents of vaccination against cow-smallpox (etching of Gillray in 1802): Small cows slip out of the vaccinated persons. Also note the scarification, which are the scratches on the upper arm. Every vaccination led to enthusiastic support as well as to staunch opposition due to the considerable side-effects. Thanks to Jenner in 1796, the previous variolation (= vaccination with mild human smallpox) was replaced by the vaccination with cow-smallpox (vacca = Latin for cow). Whereas Bavaria already introduced compulsory vaccination in 1807, Prussia (and the German Empire) only followed suit in 1874. Thus, only 89 people perished in Munich in 1871, whereas 623 people died in Berlin (per 100.000 inhabitants). Before the cholera epidemic hit Hamburg in 1892, the Senate and citizenship decided to expand the customs harbor and build a new, more representative city hall instead of the proposed sand filtration of the water of the Elbe, which was used as drinking water. This decision cost the lives of 8.605 citizens (1.34% of the population) while causing over 17.000 inhabitants to become sick. During the Enlightenment, pastors started preaching against the public opinion, which stated that epidemics were a punishment by God. Instead, the pastors spoke of God’s will for each person to maintain good health for him-/herself and the children, also by means of vaccination. Inadequate education allowed many conspiracy theories to thrive: It was observed that plagues broke out in the quarters of town where the poor lived. Thus, it was presumed that the upper class was intentionally poisoning the poor. When the cholera epidemic broke out in Koenigsberg in 1831, the mob stormed the main police station, destroyed the lists containing the names of the infected inhabitants, and beat up the public-health officials. Due to the previous cholera outbreak as well as out of hygienic necessity, the Bavarian government urged the rural population in 1857 to bathe frequently. In 1896, the Imperial Department of Public Health in Berlin issued a deliberately neutral publication which was designed to argumentatively convince the opponents of vaccination. A map of Europe was presented to show the significantly higher levels of smallpox in countries such as France or Russia, where a general vaccination was not being offered, compared to the German Empire. The comprehensive and objective education of the public still plays a vital role today. Apart from the prevention of panic reactions, such education also helps fight HIV/AIDS or helps inform the public about the ban of having animals graze in water-protected areas.